Moseley Road Baths got a plug on BBC Radio 4’s ‘A History of Britain in Numbers’ this week. Presenter Andrew Dilnot visited the pool and spoke to Steve Beauchampé about the Victorian vision that was responsible for the development of these kind of municipal buildings, particularly in Birmingham. You can ‘Listen Again’ online, the whole programme is only 15 minutes long, Birmingham is featured from around 5:55mins. 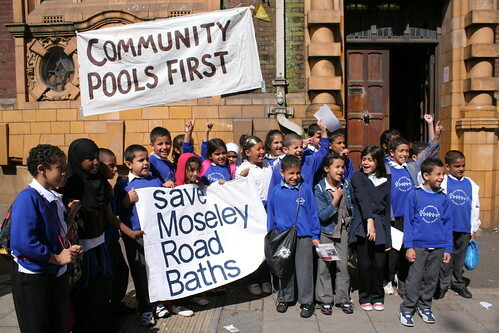 With Moseley Road Baths set to remain closed for the whole of the school holidays we’re inviting you (and if possible, your children) to join us outside the baths at noon this coming Monday, July 25th – the first day of the school holidays – to express disappointment and unhappiness at the continued closure of Moseley Road Baths. We’ll take some photos and are inviting the local press along so bring your swimming costume (not to wear, but to hold up as it makes a much better picture!) and together we’ll try to increase pressure on Birmingham City Council to get the baths reopened for the first time since December 2010. If you can get along that would be great, if you could tell a friend, that would be fantastic too. We’ll need you for about 15 minutes. Thanks. Local pupils have previously made their views known! Pupils in Balsall Heath have been learning about the history of Moseley Road Baths and creating short films based on their interviews with people who have memories of the building. As part of the Friends of Moseley Road Baths’ ‘Pool of Memories’ project, funded by the Heritage Lottery Fund, they have been working with local film-maker Rachel Gillies to create a series of short films. The pupils have taken a tour of the building, done research about its history and learnt how to conduct filmed interviews, before editing their footage into short films to add to the group’s growing archive. 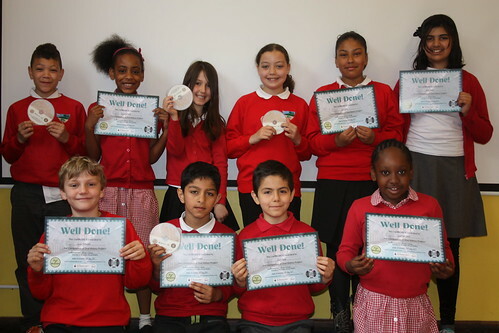 Pupils from Park Hill Primary School in Moseley screened a Premiere of their films in a special assembly on 16th May at 9:00am. They include an interview with someone who almost gave birth in the pool, and another interview with a local stonemason who shared his memories of work to the windows back in 2004. The Friends of Moseley Road Baths secured Heritage Lottery Fund money to run the extensive, 3-year oral history project, based on the history of the building. 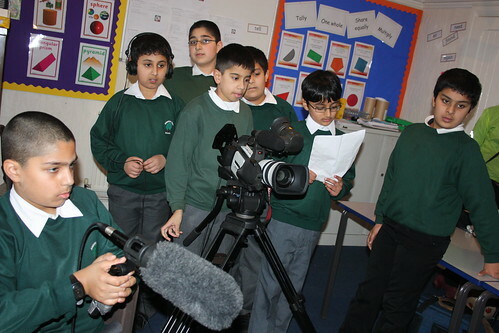 Four out of nine school projects have been completed, with more than 35 young participants from four schools so far creating more than ten short films. The work of the young historians has been added to a dedicated website, www.poolofmemories.co.uk as well as being used in local screenings and in educational projects. The project is especially welcome at the moment due to the temporary closure of Moseley Road Baths whilst urgent repair work takes place. It is hoped that the pool will reopen for swimming by mid-June. “The children have really enjoyed learning about the importance of the baths within the local community. In addition, being able to interview local residents and make a film about it has been an invaluable experience!” said class teacher Clare Belshaw. “I really enjoyed the project as I learned so much, such as how to set up a tripod. I enjoyed visiting Moseley Road Baths and learning about its rich history as well as being able to go into the areas that are closed off from the public. We also interviewed people and edited parts of the interview” said Poppy Emson, one of the pupils who took part. We’re getting more and more interest in Moseley Road Baths from people who have been inspired by the building to do interesting and creative stuff. Alex Gamela came along to our Memories and Memorabilia Day last year and gathered a fair bit of footage and photography. He’s used it to create a Flash website which gives a really lovely view of the building, as well as providing lots of background information on the history of the baths. Have a look at the site here – but remember that you will need Flash installed. Enjoy! The Pool of Memories Project Launch Event is to be held at Balsall Heath Library Moseley Road, (next to the Baths) at 3pm on Wednesday 17th February 2010. Pool of Memories is an oral history project through which Friends of Moseley Road Baths will document the history of this nationally important building and record the stories and reminiscences of the generations of local people who have swum, socialised washed or worked there. The Friends of MRB recently secured a Heritage Lottery Fund ‘Your Heritage’ grant of almost £48,000 for the project , which involves local schools and the community in the production of a book, a DVD and accompanying teaching resource pack, website and exhibition. The Project is also linked to Playhouse theatre in education scheme. At the launch there will be an opportunity for you to find out more about the Project and, if you are interested, how you can help us build our archive of memories of the Baths. We do hope you will be able to attend. Sponsored swim raises fantastic £400! 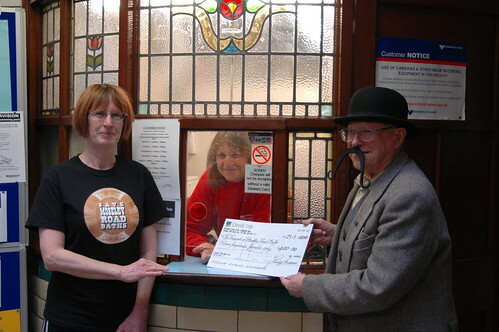 Philip Morris returned to Moseley Road Baths last Thursday to present a cheque for £400 to the Staff and Friends of the Baths. Philip who swam his first mile in the Pool in 1934 completed his sponsored swim in December last year. For so many of us who use Moseley Road Baths it’s a bittersweet experience. How to convey the grandeur, the feeling of swimming in a palace, of being taken back to another place and time? To a time when local authorities believed in providing ‘palaces for people’? But how heartbreaking to see the dilapidation and lack of maintenance! The vast majority of people who enter the building are quickly won over to fiercely believing that this valuable and unique facility should be restored to its former glory and kept for the purpose for which it was intended – a comprehensive swimming facility to serve local residents. Having that discussion with the current state of the building and the contempt of some decision makers isn’t easy. It can sometimes take a big stretch of the imagination to see how neglected areas can be brought back into use. 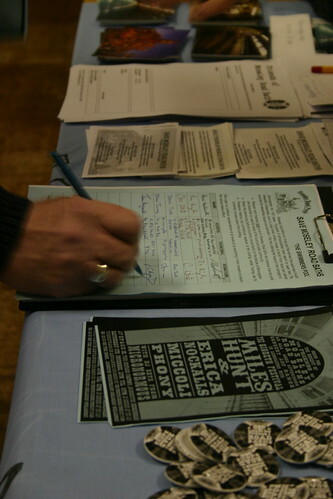 However, Alex Gamela and others on the HashBrum team have done some great work on documenting last Saturday’s ‘Memories and Memorabilia Day’ and showing both the passion and potential of the campaign. Here is Alex’s film which I think captures the bittersweet feelings of so many of us really well. Thanks ever so much! To find out about the other buildings that made the list go to the Victorian Society’s site, and also have a look at the BBC Birmingham feature on the news.